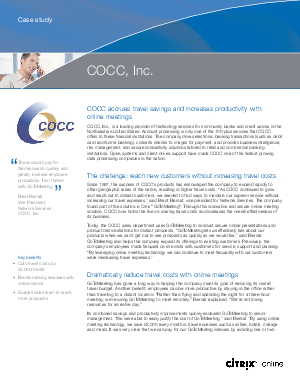 COCC, a leading provider of technology services for community banks and credit unions, needed a way to reach distant customers without increasing travel costs. That's when COCC decided to try online meeting technology. This new case study explores how Citrix GoToMeeting Corporate enables COCC, one of the nation's fastest-growing data processing companies, to connect with new customers without increasing travel costs.